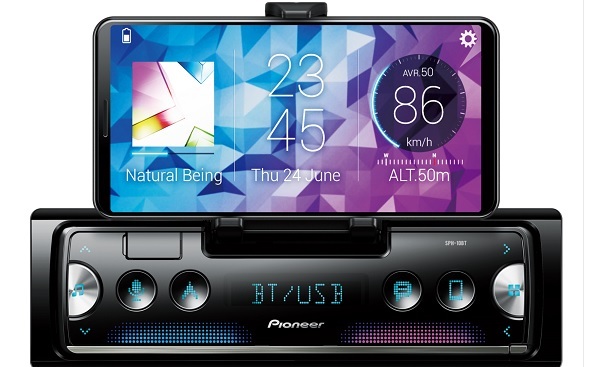 Pioneer Electronics introduced on the eve of CES a low cost car radio with a built-in dock for a smartphone. The new SPH-10BT is a single DIN, mechless (CDless) car radio. In the empty space where a CD mechanism might have been located is now a cradle for a smartphone. The smartphone becomes the touchscreen for the car radio through Pioneer’s Smart Sync app. The cradle can switch the phone from landscape to portrait and pivot the phone to face the driver or the passenger. Pioneer’s Ted Cardenas said, “Once the phone is in the cradle, it looks like a single DIN flip out screen using a high resolution touch screen.” There are even hard keys located by the phone for launching navigation and other apps. Additionally, the radio works with four optional backup sensors that can mount on a rear bumper. They provide audible and visual warnings of an object behind the car, plus a distance readout on the smartphone screen to display your parking distance from a car. The sensors are wired to a junction box and a J cable to the Pioneer receiver. The radio can also function as a standalone deck without the use of the phone. It has a 3-inch screen and Bluetooth, plus an AM/FM receiver. “We’re pretty excited about the potential of this. And the one DIN chassis is universal to both old and new cars,” said Cardenas. Shipping is expected in February at a street price of $150.